legacycentral bbs • View topic - Intercooling Hoses?? Hey everyone. I finally got the Brat into the garage. It has the 2.2T rebuilt and I did the td04 upgrade and intercooler. The Brat is lifted so the engine is lower than the intercooler otherwise a straight 7" piece of 3" Hose (2.75 o.d.) would be great but it isn't. So I am looking for if anyone knows where I can get a 3" hoses that has a 3" offset? I have the intercooler lined up straight with the intake but it is 3 inches lower. Any suggestions on that? Plus, I am needing some help with the vacuum lines off the turbo amongest the rest of the lines. Any help would be great or a shot in the right direction. Post subject: Re: Intercooling Hoses?? 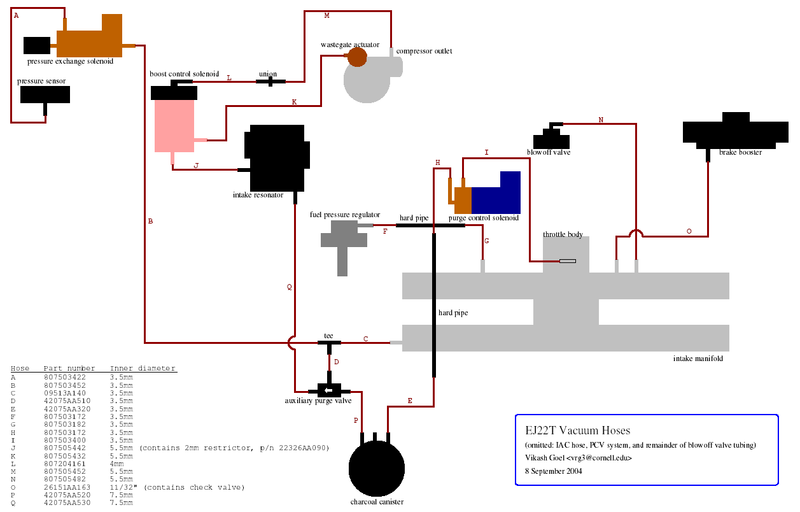 I can help you out with the vacuum line diagram that vrg3 did up! Not sure about the intercooler set-up. Something like this for the intercooler hose? I know that's probably not offset enough, but same idea? Can you post a pic?? U are awesome just-rust. That is going to help me a ton. And yes that is what I am looking for but it has to offset 3 inches from one plane to another. I will post a pic today after breakfast. Hopefully I will be able to find something to work. I just happened to go to O'reilys today and right behind the counter was a 3" flex hose that looks like it will do what I need for the intercooler. I appreciate the help guys and I am sure I will be asking for some more advice at the next issue I run into. But again, thanks a lot. Sites like these make building things some much more productive. Keep up the good work and advice. My car would be in shambles without this forum!